Paul closes Romans as he began, with a personal word about himself and the church in Rome. Reflecting on his life so far and where God will take him next, Paul discusses two themes: 1) the situation of church at Rome, and 2) the future of his ministry. 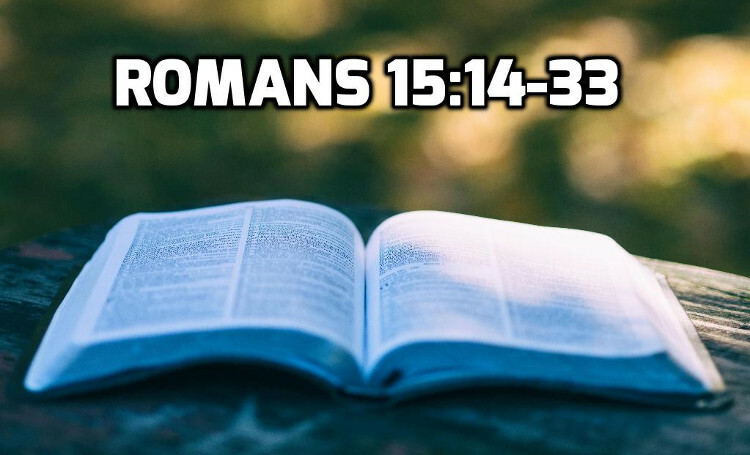 As you study Romans 15, you might want to compare what Paul says to your own church and ministry. They are full of goodness in the sense that they are motivated by a sense of goodness, because God has changed their hearts to strive for it. They are complete in knowledge in that they fully understand the gospel. They are competent to teach one another, sharing the wisdom God has given them so far. No matter how well taught, they still need a bold reminder of the truth. They still need a “priestly ministry” — someone to speak to them about God and remind them of the truth. His boast and worth stem from what Christ has accomplished through him. He is delighted to be who he is. He is so confident because he has seen Christ at work. He has finished his work in the east and is looking west toward Rome and Spain. Paul planned ahead, but his plans were flexible, he was persistent and he involved a team. Paul’s three prayer requests were granted in a surprising way. He was rescued from the unbelievers in Judea by being placed in Roman custody after being beaten. His service to Jerusalem was acceptable but stirred up a lot of trouble. He did go to Rome but it was over 2 years later and involved prison and a shipwreck.